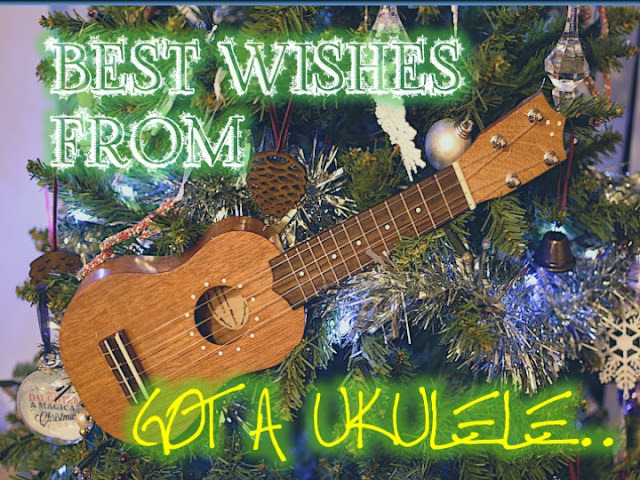 A short note as we approach the Christmas holidays wishing all Got A Ukulele readers the very, very best! And if Christmas isn't your thing, perhaps happy hanukkah, joyous kwanzaa, eid mubarak or yuletide felicitations... Whichever, just be nice to each other! Enjoy yourselves, play some music, spread some joy and be sure to let me know about any new ukuleles you found under the tree this year! And thanks ever so much for your continued support this past year. I'll be back at the turn of New Year with a look back over my favourite posts of 2016, and then I have a host of new instrument reviews and articles lined up for the year ahead! Have a great break, Barry, and thanks for all the hard work! This is my go to site for instrument reviews and good sense - you are much appreciated. Merry Christmas! One of Santa's elves just let me know that I have to wait just a little longer for my Christmas ukelele. They have outsourced to a little workshop in Caerphilly! Thanks for the great reviews, articles and videos!looking forward to more in the new year. Merry Christmas Barry. Thanks for all of your work. It is so helpful to a retired rock drummer turned uke lover. A package is on its way from the ukulele site to be here for Christmas. This will be my second in about two months. Gotauke and your reviews are must reading for me. Happy Christmas Barry. I look forward to all your reviews and musings in the New Year. Merry Christmas .I always check your ukulele reviews and have bought a few because of them . Merry Christmas Barry. Thanks for all your posts in 2016. This is one of my go-to uke blogs. Thanks to all for the comments - been away from the blog with family and getting ready for the 25th. Back at new years eve! Have fun everyone!